Over the Thanksgiving holiday 2012, 140 vehicles in Texas collided, leaving two individuals dead and more than 80 people injured. The mass car crash happened in Southeast Texas, tragically disrupting the lives of many. Trucks ended up twisted on top of each other and authorities rushed to help survivors from the wreckage. The collision happened in extremely foggy conditions at about 8:45 a.m on Thanksgiving Day. Cars spun out of control, hitting each other on Interstate 10 southwest of Beaumont. A man and woman died at the scene in a Chevy Suburban SUV. Beaumont is a Gulf Coast city about 80 miles east of Houston. 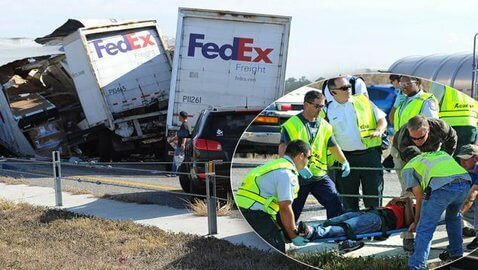 A tractor trailer crushed the man and woman, according to the Texas Department of Public Safety told KFDM-TV. Jefferson County sheriff’s Deputy Rod Carroll reported in a news release that 80 to 90 people were hurt. They were taken to hospitals. Of those hurt, 10 to 12 of them were in serious to critical condition. Law enforcement reported 140 to 150 vehicles were in the pileup. If the Texas wreck was the fault of anyone, the family or friends of the injured and dead might have to file a wrongful death case against the responsible parties in order to get justice for the pain they suffered. According to the Texas Department of Public Safety, a crash on the eastbound side of the highway resulted in chain reaction accidents. The death of a loved one in a car accident is a life-changing event that may never fully be put in the past. It is troubling to think, in a split second, the family members of the man and woman, and the persons injured in the multiple crashes, might have suffered physical and emotional injuries they may never fully recover from, and the life of two people ended forever, with no one ever to experience their energy, smile, or love again. Besides the pileup, there were multiple crashes on the other side of the Texas highway also. According to The Associated Press, the fog was so thick that deputies didn’t quickly realize they were dealing with more than one wreck. There were cars on top of cars in the catastrophe. I-10’s eastbound lanes re-opened Thanksgiving Day evening after more than eight hours. Those who were not hurt in the wreck attempted to help authorities sort through the crashes. The Good Samaritans were overwhelmed, but sitting and holding, the seriously injured people.